Japan and South Korea are increasing collaboration with non-U.S. firms, driven in part by Washington’s reluctance to transfer sensitive technologies. 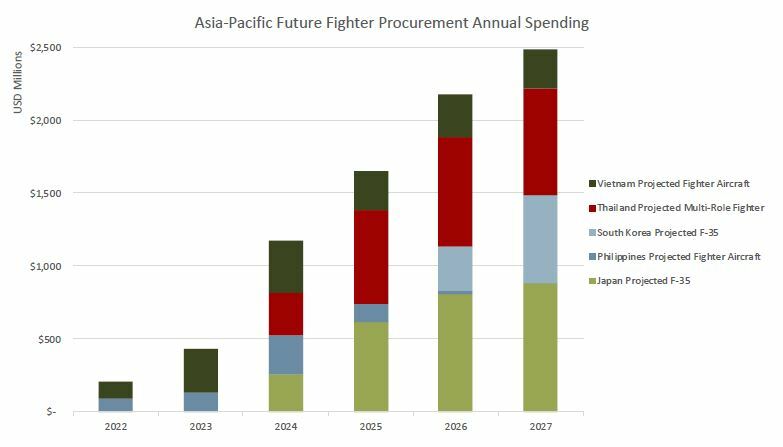 Avascent’s piece analyzing Asia fighter programs made three observations about the region: First, developmental fighter programs will take more money and time than planned; second, despite indigenous developmental projects and ongoing F-35 acquisition, Japan and South Korea are still likely to require new offshore fighters and to modernize existing aircraft; and finally, Southeast Asian fighter recapitalization will take time as these militaries grapple with budget pressure and squeeze additional flight hours from legacy aircraft. Threats from China and North Korea, together with imperatives to stimulate domestic industry, have led Japan, South Korea and Taiwan to develop indigenous fighters: the Mitsubishi Heavy Industries-led F-3, the Korea Aerospace Industries KF-X and Taiwan’s future fighter, which will involve the Aerospace Industrial Development Corporation and the National Chung-Shan Institute of Science and Technology. All three projects will need assistance from more experienced fighter manufacturers to yield operationally effective aircraft, presenting potentially attractive partnering opportunities for Western firms to support integration and subsystem development. Traditionally, these countries have relied on the U.S. for advanced defense technology, but in part due to Washington’s reluctance to transfer sensitive technologies and U.S. fighter development timelines not aligning with Asia, Japan and South Korea are increasingly collaborating with non-U.S. firms. Saab and Elta are aiding in the development of the KF-X’s active electronically scanned array radar, while Japan is exploring fighter collaboration with the UK. Foreign assistance may shorten development timelines, but full rate production is unlikely before the 2030s. These “next-generation” fighters may be obsolete by the time they reach initial operating capability. Potentially worth more than $40 billion in development and production, Japan’s F-3 is the most ambitious fighter project in Asia, but it will need to contend with Chinese stealth fighters which will have been flying for about 20 years by the time F-3 enters service. In recent history, Japan has only spent roughly 3 percent of its total defense budget on research and development and a much larger R&D budget would be needed to simultaneously accommodate F-3 development and other important programs. For example, South Korea is projected to spend 30 percent of its defense R&D budget on KF-X over the next 10 years, and the F-3 could be a larger and more complex project. The R&D burdens could be much higher for Japan, driving Japan’s desire to find a cost-sharing partner nation for the program. On the other hand, Taiwan faces the largest challenges in developing the necessary technologies, as retiring engineers, competing budget priorities and challenges securing U.S. assistance all raise the question of how Taiwan plans to successfully execute its XT-5 trainer program. These three projects in Japan, South Korea and Taiwan are portrayed domestically as ways to import new advanced technology, support local firms and lay groundwork for exports. Both Japan and Taiwan can support their earlier-stage projects by strengthening industrial security protocols to build U.S. confidence in their ability to protect sensitive technologies. Exports are a tougher proposition, as Korea Aerospace Industries is witnessing with T-50 export efforts: competition in the global aircraft market is intense. Developmental fighters will take some time to reach full operating capability, therefore these countries will have to purchase off-the-shelf aircraft as well as modernize existing fighters to match evolving threats. South Korean, Japanese and Taiwanese interest in aircrafts like the F-35B and the E/A-18G Growler highlights the recognition of the interim “fighter gap.” Growing fleets of fifth-generation aircraft will require efforts to integrate 4/4.5-generation fleets, as not even the U.S. can afford an all-fifth-generation fleet. Countries increasingly understand the importance of electronic attack and control of the electro-magnetic spectrum. Failing to upgrade and integrate legacy fighters, as well as not having a plan to address electronic warfare, would constitute a failure to capitalize on the networked situational awareness that fifth-generation aircraft provide. Tighter budgets and different threat environments to Northeast Asia, along with the timing of fleet retirements and upgrades, mean that recapitalization of fighter fleets in Southeast Asian countries may not be completed until the late 2020s. Aging aircraft like Thailand’s F-5 and Vietnam’s Su-22 need replacement, but regional air forces have been willing to delay replacements in favor of upgrades or more creative solutions. For example, Malaysia has decided to shelve its MiG-29 replacement and pursue a light combat aircraft that can serve training roles. These market dynamics have led to greater interest in versatile light combat/trainer aircraft. The Philippines and Thailand already own Korea Aerospace Industries T-50s and are expected to order more. Vietnam and Indonesia are also expected to buy similar aircraft to replace their older fleets. In conclusion, Asia is quickly assuming the mantle as the most exciting region in the world for fighter sales and upgrades. While broader generalizations may be made about the region, heterogeneous geopolitical and business factors require companies to tailor their approach to the individual country’s market. Download the full e-book, including Avascent’s piece here: Asia Fighter Review.